3 jenis tanaman bambu yang paling dicari kerena memiliki nilai artistik, dan juga mudah perawatannya, serta bisa berfungsi dengan baik sesesuai kebutuhan yaitu sebagai tanaman pagar, sebagai fungsi tanaman pagar bambu memang dikenal sejak dari dahulu sangat kuat, bahkan sangat mudah perawatannya, tidak memerlukan perawatan khusus, hanya sekali sekali perlu penyirman, dan sebagai tanaman pagar juga kemampuannya tidak diragukan lagi, hidup secara berumput dan bisa berumur sampai puluhan tahun. bambu jepang; sipemilik batang hijau dengan diameter 4 cm ini dikenal sebagai pagar jalan tol yang juga berfungsi sebagai peredam kebisingan, sudah terbukti bisa hidup dengan baik dan tidak memerlukan perawatan khusus, ketinggian bila ditanam liar bisa mencapai 7 meter, tanaman ini di penjual tanaman hias dijual dengan harga Rp. 21.000/ rumpun isi 3 batang ukuran tinggi 2,8 meter. 3 jenis tanaman bambu paling dicari untuk kebutuhan taman. Untuk material vertikal garden, sebagai tanaman yang dapat difungsikan sebagi table plant yang dapat hidup dalam ruangan maupun luar ruangan, kuat terhadap tempat teduh maupun terik sinar matahari, tanaman ini dapat dijadikan sebagai material pembuatan vertikal garden, baik untuk dalam ruangan maupun luar ruangan. 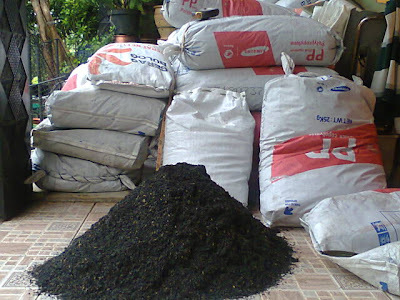 Compost as a planting medium like as Rice straw or other agricultural waste soft, it easily composted. Only with stacked just, lapse of three months later the material was going to be composted. But so will compost quickly solidifies and sticky. If compost is used to fertilize rice fields or fields, the compaction and sintering are not an issue. The fields are lush, the mud is composed of organic materials that have been destroyed and become sticky. Different if the compost will be used as a planting medium pot. Media planting pots require a high level of porousitas. The more that will be planted ornamental plants like ferns. 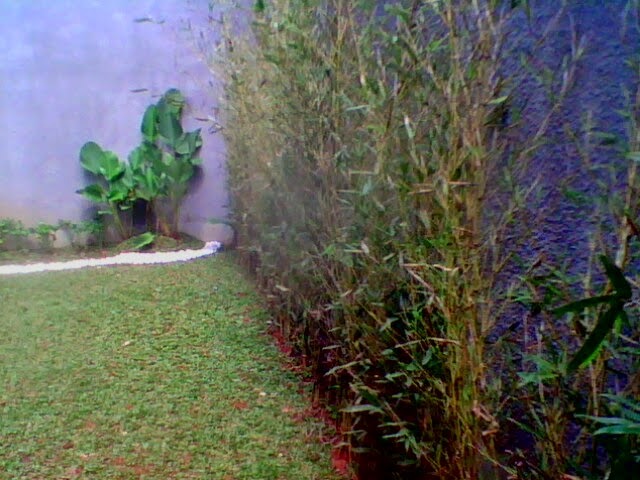 That is why maidenhair ferns and ferns will only grow better if planted with bamboo planting medium humus. Because despite being destroyed, bamboo humus remains neutral (pH 6.5 - 7). The destruction of a bamboo humus also still form a porous mass, does not compact and not sticky. Until the water is poured into the media will continue late into the bottom. Bamboo is called humus, leaf litter remains, sheath and bamboo twigs scattered under the clumps. Humus bamboo is an excellent medium for growing specific maidenhair ferns and other ferns in pots. Up to now, there is no other more appropriate medium for growing families ferns besides bamboo humus. Compositions for planting medium pot, it should be possible. If we only use a soft organic materials, such as straw, then a period of less than one year, the media would already be compressed. If the pot is placed in the crops, it does not matter. Because when the media has been compressed, will be the replacement plant. Similarly, if the plant needs repotting dipotkan it (replacement pot) once a year. Along with penggantiap pot, also conducted replacement planting medium. 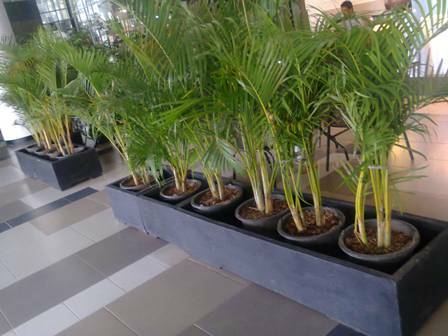 If it is planted palm that is not necessarily done repotting every two years, the media compositions pot should really be taken into account. First of all these media require easy compost materials such as straw destroyed. Second, the media also requires that water-binding agents such as cork softwood bark, coco dush and clay. But the media also requires organic material that is not easily broken. For example sawdust (or poo shavings) from hard wood. In Australia, for example, used sawdust from oak and eucaliptus very hard. Here, it can be used sawdust teak, camphor, Rasamala etc.. And lastly, composting requires fine sand that condition remains porous. Comparison of each of these media depends on the type of plants. If planted crops that require a lot of water, then the components of clay and powdered cork enlarged. If these plants require a high level of porousitas (not like water) then the composition of sand and sawdust are propagated severity. That requires a lot of water is a plant with broad leaves and soft. For example, the types of impatiens, begonias, etc.. While that does not like a lot of water is a type of ferns and cactus and succulent especially. Media for cactus and succulent, even enough to be a 75% fine sand and humus (compost smooth) 25%. Cactus and succulent really do not like the water until watering is only done once a week enough. Cactus and succulent pots should be placed in the green house, to avoid the rain. 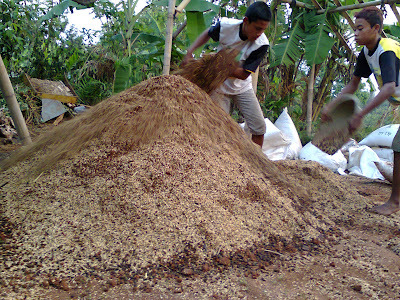 The ornamental plant breeder Selecta (East Java), Bandungan (Java), Lembang and Cibodas (Jabar), using a compost consisting of normal soil mixed with chaff former broiller chicken litter. The comparison, 1/3 soil mixed with 2/3 chaff. With this media, media porousitas can stay awake. Because chaff will be destroyed after about two years of mixed tahah. Seed plants for a period of less than one year must have been terpasarkan. In addition because of porousitas, media usage husks also meant that crops sown in bamboo baskets, plastic bag, or most of them in a clear plastic bag, it becomes lighter when transported over long distances. For the purpose of reducing the weight of breeder seed is the fruit crops in Thailand using cork media moss or coconut coir (coco dush). The meaning is the root kadaca moss (bird's nest fern). Using moss and coco dush media is done, since the lifting of seedlings of the land to be transferred to polybags. With moss and coco media dush, the weight of the seed crop could be reduced by about 2/3nya. Till when using a soil medium weights seeds contained in a 2 ton pick up, for example, then the media moss and coco dush weight will shrink to 0.66 tons. While the volume remains the same. Thus the transport of seeds, usually with stacked (laid) crisscrossed sleep. Until the vehicle capacity can be quite large. Making compost in bulk, made by mixing various ingredients in a shaded space. Usually dirt ruminants (cattle / sheep), swine and poultry mixed with sawdust. Mixing is done by heavy equipment in the ward that the width can be as big a football field. Along with pangadukan, adding water, starter bacteria and also in the form of oxygen. In this way, the composting process can be shortened just a few days than it should be for about three months. For use in regular land, the finished compost can be sown directly. But for use as a medium pot / polybag, compost is still to be mixed with a variety of materials. Nursery-nursery, usually prepared materials such as compost for growing media, fertilizer guano (bat droppings), fine sand, hardwood sawdust, rice husks, cork (of bark or coco dush), limestone and clay. The material was to be mixed according to plant needs. Ornamental plants such as Aglaonema, anthurium and begonias for example, requires more media composition of organic materials. Up to this part of the compost plants at most. For example, up to 60%. Of which 40% consists of cork, hardwood sawdust / husks, clay and sand. For such plants require a fixed porous media and contains a lot of water. Unlike the cacti and succulent plants. Including these plants are Adenium and Euphorbia that lately in vogue society. These plants actually need more sand as the media cropping. Until the composition is reversed: 60% sand and 40% compost and hardwood sawdust / bran. Clay and cork are not required. For the second function is the binding medium of water. Though cactus and succulent it does not want the water. Ornamental plants such as ferns, require a porous media, still wet but does not contain a lot of water. 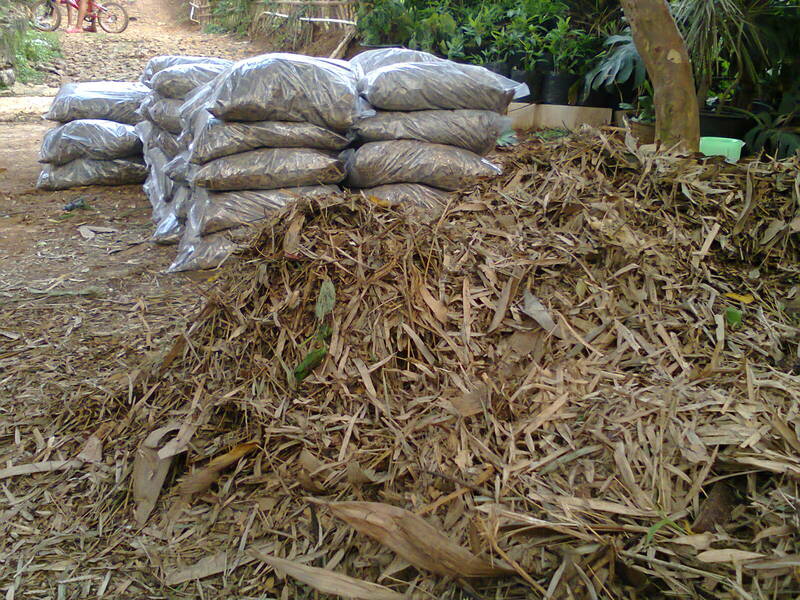 If there is no humus bamboo, media composition for ferns consists of 60% hardwood sawdust / bran and 40% compost. Straw, both rice and wheat straw, compost will yield homogeneous soft and easily compressible / solid. Sorghum stalks and relatively heterogeneous, ie, composed of fiber and cork on the inside as well as the hard bark on the outside. However, maize and sorghum stalk still could not last too long as the planting medium pot. The most ideal as compost are twigs and leaves hard wood. In Jakarta, the logging / lumber angsana just thrown away in landfills (Landfill) Capital trash. In fact, this waste can be shredded and composted with chooper. Compost from the following branches angsana leaves is quite good, because the leaves will rapidly disintegrate, while the woody branches will be able to last long enough. Skin and corn cob is also a pretty good compost material. Skin corn contains a lot of strong cellulose, while cob contains many hardwoods that will take a long time to disintegrate. If the skin and the cob is combined with corn stalks and leaves, would be an ideal compost material. Similarly, stems and skins of peanuts. In our country stems and leaves of peanut forage is highly qualified. While the skin is discarded or burned more futile. In fact, compost peanut shells are pretty good, which is to substitute cork materials and hard parts. Materials for indoor plants planter box varies, one with wood, in addition to manufacturing materials such as wood, mortar and sand, fiberglass, brass, aluminum, iron, copper, stainless, bamboo etc.